when did the year of the pony start? for us the ponies took over April 1 , 2013. T.A R D.I.S. in real life, (some of the pictures are beyond comprehension) and pony barn, cloud furniture T.A R D.I.S. 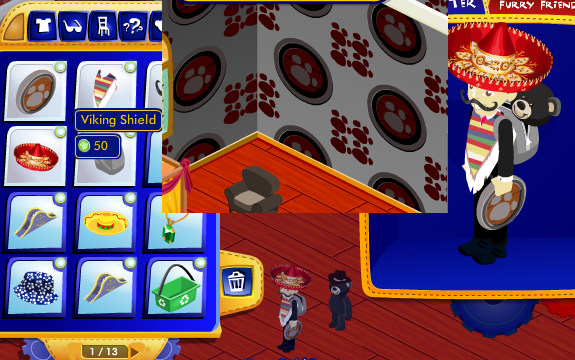 using small fry tech to enter on bearville.com. The Clydesdale from Busch Stadium was gifted over the summer-from someone's work giving tickets and stadium bucks. total out of pocket almost $5.. we do bargain hunt.. This week - ponyland took over the tablet community at our home. Buying selling, breeding ponies and furniture (free app) to get more choices keep leveling up with money and gems and experience points, the occasional task list and gifts from friends - both known and community. Another method of earning coin is by placing in the horse races. More given for first place, some to second and third. Not really racing against friends, though names from the friend list are on the other contestants. Anyway, The Great Big PAW Sale arrived today at BABW . By the time we arrived home, 4 small fry, Clydesdales, (with their boxes) were shown with 2013's horses and pony land was blamed. After coupon, gift card and others buying toward the $30 coupon, $5 sock monkey, $3 small fry outfit, and $3 passport (cash) , ended up paying the sales tax for the four small frys total paid toward smallfry -$1.81. Now the Clydesdale furry friend can also have online - cloud furniture T.A.R.D.I.S. (current tech is starting point only) can end up at 3 not available by map locations or most map available locations. Was working for North Pole while open, but not since closed. I find the fact that the ponies have been here since April and even though 1 s.f. clydsdl had shown up in Sept. it was not tied to the others until the app - Pony Land. Have about the same amount of coin in pony land as bearbills for main account. Now when to bring the s.f. 's online and to what accounts. The story continues. None of the little one's look like the dash. Pony Land allows different breeds to be born from the same combinations of parents. 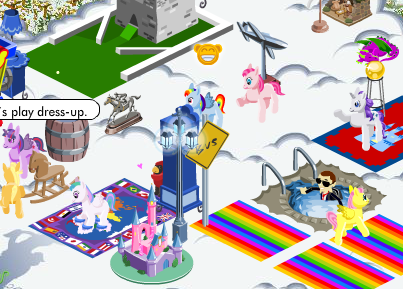 Many more levels and better unlocks on pony land than bear valley. Can look at friends corrals also. Some tasks are much quicker when doing chores on others corrals. Can get to winged horses and unicorns, zebras and donkeys and reindeer. the four small fry clydesdales went to different households during valentines celebrations. sharing the joy, two went to younger kids, 2 went to older adults to comfort through pain. kids (and their parents) hugged to face and even elder adults could squeeze with one hand and each put to face rather than chest hug. loving the small, share the love. big animals would have been too much size and cost. 2 replacements were purchased, (still bargain priced) one is scheduled to go to another elder when works out. one to stay (we shall see). finished all ponyland levels that unlock stuff, has been updated twice (at least) since last mentioned with different objects, animals, backdrops, still no clydesdales, though many named dr. whooves, clara, and other character names. still awaiting reindeer to emerge from delivery basket. 5 days if no help. Clydesdales for 12,000 children from the same place that Doctor Hooves came from. as posted on Cardinals website. No Bearville code for this? It's been years since they put codes on the promotional giveaways at the stadiums. Happy Bday Rainbow Dash /companion of the Doctor!!! Picked her up from babw last April 1st. Have one smallfry Clydesdale still here. (kept all the codes). five given away so far. Pinkie Pie and Fluttershy have joined the household this year, though they stay in different rooms. Was so thrilled to add Rarity to the household in March. She is still wandering the area not really finding a lasting pose/place. She looks really good, then she has a motorcycle. it does not fit in with Rainbow on the printer. Bought (with much discounts and some cash) Twilight for a relative at a different household. A lover of all things purple. Updates for St. Patties, V-day, and Easter on ponyland. the critters are testing out strangeness. being made of horse, or metal, wood or paper mache'. Lately, eggs in mane or Rabbit ears hanging down. enjoying the red bearded ones. 3 major performances for members of household same week. Recorded performances we are (small) part of are now being broadcast on radio. Real life continues.. High Ho Rainbow and away..
toothless and PSI has arrived .. and departed. I wanted to say with much anticipation how great the toothless psi would be. a dragon to ride on bearville.com. not just wings like the year of dragon or peak's dragon, but a dragon that was ride-able just like the movie. but alas this is not the case. maybe a dark pony or zebra to avoid copyright issues. 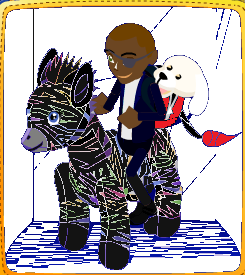 Nick Furry on a dark zebra. or Phil Son of Coul on a dark pony still hiding out in cinco de mayo costume. both of which could be done changing colors of existing non-franchise animals/rides. I use ms paint to change the look. the actual psi is not a ride at all. I thought it was a trashcan lid until someone else told me twas a viking shield. though not held like a shield...nor for a wall hanging to add to a viking village room decorations, (hint hint). no dark pony or dark zebra for s.h.i.e.l.d. agents to be less conspicuous. black bear, circle with paw print in it, same for wall paper. ordered Wednesday when first was on website (before multiple sold out disappointments) so did not receive poster available in store with purchase. Received Saturday. passed the stuffed animal on to the 20plus year old as requested. He seemed disappointed in the stuffed animal. flat wings, no saddle. face looks good and scale pattern is a plus. figure it might end up on Ebay when he sees the inflated prices being fetched. How far have our expectations fallen? was hoping for some respite from the tragedies that we were dealing with, at funeral home/gravesite of less than one day old cousin from more than 20years before, memorial day weekend. then visitation for pastor's 19 month old grand daughter, who died suddenly. We needed a exceeds expectations not another all hype with low ball follow through. I'm sorry to hear that your family has been dealing with so much loss. As for Toothless, the reactions across the company have been far different from yours. All our guests have raved about him and say that he's the best one to come out in a long time. Most guests who got one were very impressed with both the quality and overall look of the dragon. My daughter picked them up for us on Friday and her store sold out of them that night. I had mine for a grand total of 2 hours before it got handed over to my niece. I did get one online yesterday before they sold out. As for the online reward - I like it. It is completely different from anything that we've seen so far and lately rides have been overdone. 20 plus year old had been in Bible study with parents of toddler. He did not hug toothless at all. once over and tossed in car. as mentioned in previous posts, use babw animals to help comfort others in times of loss and pain, for old and young. even though desired beforehand, no comfort, no thanks later. read facebook comments on wings. all negative. same points as ours. we already have midnight teddy, (currently wearing Thor costume in real life) so animal not new to us online. see picture comparing midnight teddy to toothless. shadow different. the young ones were not quick to notice differences with toy r us version of toothless other than premium price of babw. cos-play Captain America on bearville.com looks better with same old red or even blue lifesaver than 'new viking shield'. too many accessories, want small fries in hand. still looking forward to completing daily task goals for rides. far from over done. enchanted ponies why we got into build-a-bearville.com still riding and still wanting improvements. (see above pix). return to exceeds expectations not pull off the already been done list- this one - like first two palace pets online. but please continue fresh dialog even though not the same as our experience. 20+ has been spending time with his best friends family this week. 20+ had gone to different state to be in his best friend wedding earlier in 2012 or 2013.
no mention of using BAB to comfort just to profit off hype. Pray, grieve, pray some more. Our household has added our own Twilight Sparkle, (had been in StarWars emperor type cape for week, now taken down, hair brushed a few times. the source of model for art work of young one. Haven't bought to life online yet. May wait for AppleJack to complete the mane six MLP. did use accessory coupon to get cowboy style hat for ApJk. is between rainbow dash head and Rarity wearing butterfly wings on printer. haven't been buying MLP outfits/acc to this point. Prob get forth palace pet while on sale...would rather get pony/horse palace pet, when is it out? celeb/pony happy camp party idea - cloudsdale style room weekends after applejack emerges . the mane six are looking to reunite in bearville.com. bring a pony or dress as a celeb or both. show team support. did I show the 'when franchises collide' pic? 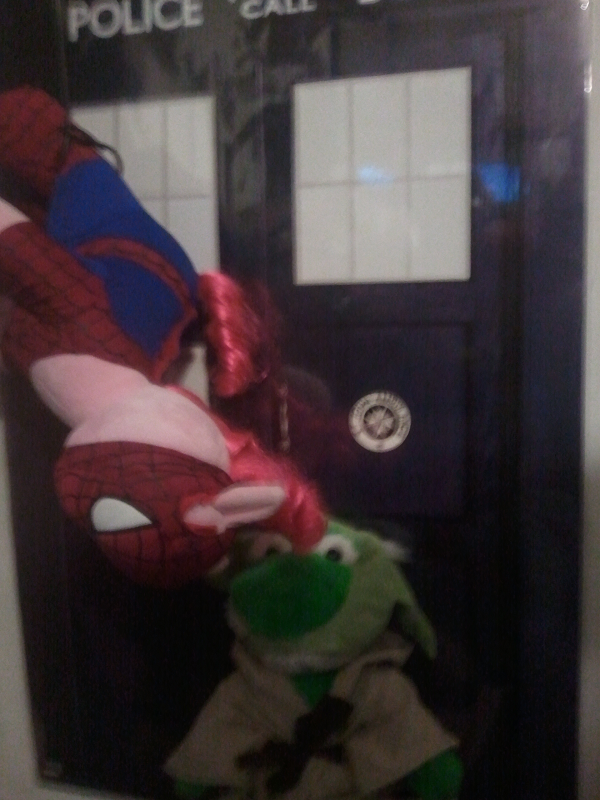 spidie pie is dangling from web saying "my pinkie sense is tingling." Jedi dressed Yoda saying "May the forth be with you.." T.A.R.D.I.S. in background. What to write, how much to tell, please give positive comments for this and other posts. After much anticipation, the mane six my little ponies (mlp) are together in our residence. Clara (Rainbow Dash) and Diamond (Rarity) still at their posts atop the printer each with an ear bow (free from babw), an ankle/wrist bracelet (free from community picnic) -'America!' and 'USA'. Around their necks - each has something different. Clara has a green bead necklace from community St. Patty's parade. 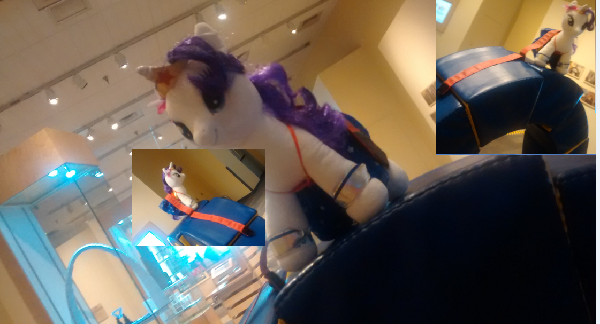 Diamond has purple strap around her neck - holding on rainbow butteryfly wings (from BABW animal). They have been beautifully posted for months. Twilight no longer wearing empress cape is atop a babw condo box, sloped back looking up. AppleJack has bunked with Fluttershy. Pinkie Pie is residing in a separate bedroom. Haven't been able to bring ourselves to buy mini (no bearville.com presence) Spike, even with coupon/stuff4stuff - no dollars out of pocket. Party on bearville.com bringing all six together at babw. Twilight flying! Family member that knew me my entire life passed unexpectedly. Many stages of grief. I had just taken them to babw for first time less than month before. Enjoy loved ones in time -you are together. Love them now. ponyland has returned (via new phone) so many updates. been corresponding with the director at Build-a-bear mentioning communication issues between babw employees and their contact to outside customers. “While mobile is a fantastic experience amplifier, it’s tough that now we have another experience on these devices that are so much smaller,” said Brian Sawyer, managing director of interactive and ecommerce at Build-A-Bear Workshop, St. Louis. “The guest comes in and they know more than sometimes our associates know at times, and so it is a highly-educated [shopper who] knows what she wants when she wants it,” he said. Bear Valley - no updates since month came out. calenders out of date most often -not even current month on website/bearville. 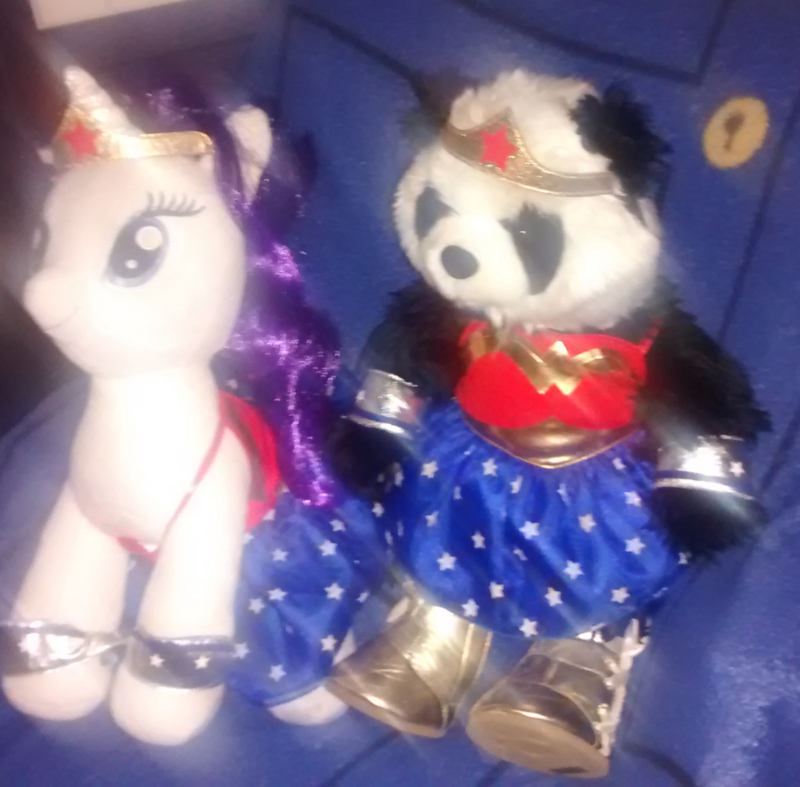 received b e a u t if u l wonder woman babw costumes. rarity/Diamond wears it well. Shiny - authentic - made me want to put on bearville, could not put on mlp so did avitar. 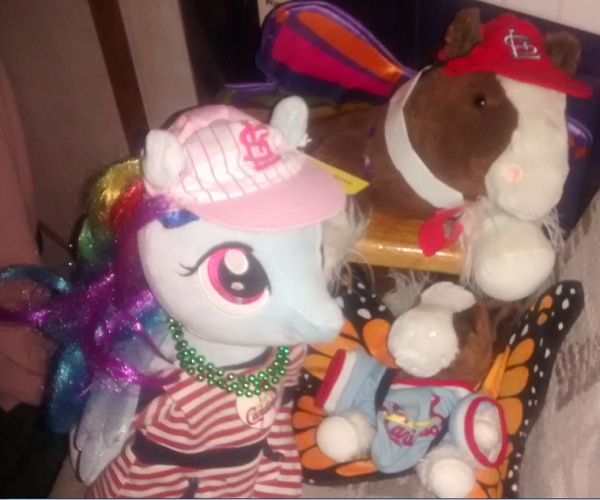 Winged pony family after cheering for cards in game one NLCS - no runs, tough loss. Enjoying the time we have with our loved. Diamond rarity heard that they were working high atop a StL. landmark. She was dressed for the occasion and strapped on. have a corral on ponyland called my lil pony6 - no stress - can feed and clean or not. fill more baskets (lil ones) or not. race or not. decorated with appletrees and apple baskets, different backgrounds, pleasing results. the looks of the ponies are somewhat reminders of their TV counterparts, just to enjoy. ponyland game had multiple updates before 31 oct. with ponies of horror shows, drac, skele, undead, frank's monst, took a while to get them for free, but finally did. a couple of updates since the 31 date, but not interested in all the new choices but have a few ..
Loaded santa's merry mission - did reindeer runner a few imes never getting good at it or being that interested, until found out can unlock more games after going far enough - someone else said 15000 yards, did a couple hundred per run sometimes. unlocked medallion/token to unlock reindeer of choice then can play 2 more games and spend stars on stuff for one deer. think that is what buying team medallion from babw would get. only update was to give menu choice to input token/medallion. More stuff to show up in December. we shall see. 3 of family asked for current babw animals, so have purchased using discounts we had. have earned another stuff reward, bought $10 gift card for $5, now awaiting arrival of MLP Princess Cel(e)stia to complete desired collection at this time. Dr. Whooves and Shining Armor would be good if they are made, but not sure of any news at this point. pray, pray and pray somemore. too close, too extreme, have mercy on me a sinner. enjoy those loved ones and remember whatsoever you have done unto the least of these my brethren you have done unto me. ponyland - more updates since Thanksgiving. added 3rd spendable currency-coins, diamonds, candy canes. Can get 200 candy canes (once so far) from racing ponies activity, 25 cc from leaving gifts and now received 50 candy canes - when opened gift from someone else. looks like can only use cc to buy chances to get elemental pony (3 different ones or buy at 700 diamonds and up) that may also give diamonds or coins or cc. reminds me of abbie's market - spend so much get up to 3 unknown prizes. ended up with elemental pony from lab basket before next one unlocked and last one not part of raffle. north pole opened. no new prizes-if you went to secret dens you could find the robo celebs and get gifts for clicking on 4 out of 5. ornament quest same as previous years. MLP furry friends not allowed out of backpack/ride(even if others could/exit bp button), nor wear outfits at north pole or similar places. exception they could walk alone at Maxine's condo. family collection has mane 6 pony's and Celestia. Family did many activities together, including a couple of BABW trips. Enjoy your own family. Celestia did not arrive until mid-December. Many laughs over her activities with other flying critters before leaving building, picture of her with tornado, harpie owl, pterodactyl and other pics with people. named Rmona of Allifrey after a T.A.R.D.I.S. companion. Zoo furry was named Yes after another D.W. character. 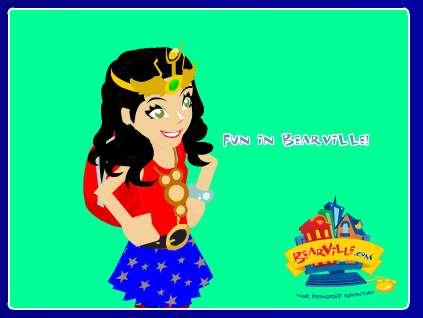 no key code, what is Bearville.com value? Death of Bearville.com is reminder of the furry animals at memorials of Tragic loss, we even gave babw product during 2014 at funeral home/visitation, graveside, and comfort value had even diminished. kids have mentioned this to me from news stories at memorials. "The creepy doll Annabelle from 'The Conjuring' gets her own spin-off movie" -is what I see from shaking dolls/furry videos. 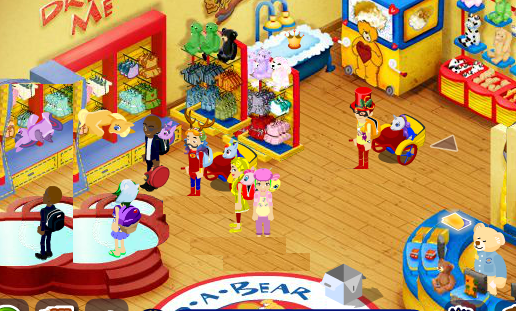 do I think of Bearville Alive - no Build-a-Bearville the tragic loss tied to product. still playing ponyland. new type of pony today. really thought they were done updating. played friendship photo safari online today. did not do well. no bearbills awarded anyway. can get bearbills another 2 ways still, but not add to account. did anyone else drive the helicopter on bearville? i saw a cyberguide driving one and went to their garage. my favorite late gif...before bv closed. ponyland is device centric. 1 account can be different nicknames and levels on different phones and tablets. one account of mine leveled up to 101 then would not open on phone anymore. i sent message to developer and did not get emailed response. i did notice what appeared to be a tester level up to 103 quickly, but my device still would not allow me to play with same development. i had to restart. from over 1000 different ponies to one. restarted after 2 week out of house statecation. saw many stuffed and living animals. now consider bass pro shop the opposite of build-a-bear. a few real fish and reptiles in enclosed environments. we did look at bows/crossbows and arrows. did not buy. family member bought swimsuit. did not find any gars in the wild this time. tiger sanctuary was awesome. and expensive. went to presentation (sales) to get admission (over $140) down to free then upgraded for $10 per person. absolutely wonderful. the first big cat was named midnight. i asked the tour guide how to get her up on the cat walk above us. she said the animal decides when/if they want to. and then this black leopard walked on the catwalk above our heads. beautiful animal. so much stronger then when was rescued. many tigers in enclosures all were rescued in usa from human owners. some lions as well. all of the interactions between our safe area and their areas were joyful.